The following was inspired by a trip to Death By Burrito in Shoreditch earlier this year. 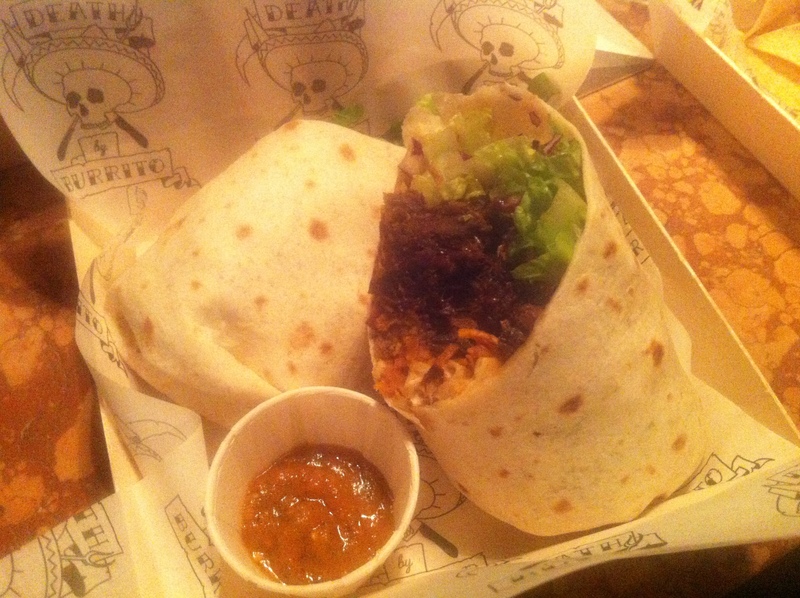 I went in sceptical, because to me going out to get a burrito should be more of a quality quick eat experience, as opposed to the sit down, dine in and be served setup that I knew to expect at DBB. But because my love for burritos is so great I set pre-judgement aside and I wasn’t disappointed. I went for the braised pig cheek and crackling burrito. In short, it was a personal mini-revelation, and made me realise there was more to burritos than just pulled chicken, beef or pork. I eat burritos out and I eat tacos at home. Tacos mean you get a little bit at a time and you can mix things up a bit. Tacos are more fun. 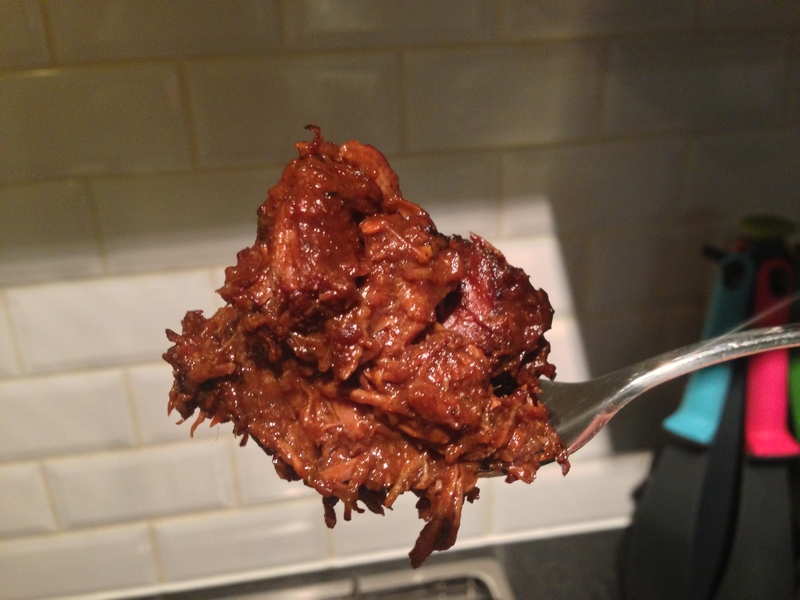 This was the first time I had cooked with ox cheeks at home. Google ‘Ox Cheek recipes’ and you’re hit with an abundance of generally boring, ‘Anglais’ slow cooked ox cheek stew combinations. To combine ox cheek with what is essentially Mexican chipotle was always the first theme that sprung to mind, mainly because to me the colours of the chipotle and ox seem to go hand in hand. I made this up as I went along, based on ingredients I had to hand, and surprised myself by how well this combination worked. The cheek is a very hard working muscle (think of all that grass chewing) so it goes without saying that it needs low and slow: three hours for the first batch I made was ample time, any more time and the meat would have shred too much, loosing texture, ultimately I didn’t want stew. Taking the meat off the heat at the right time ensures that the cheeks had an ever so slight crisp on the outside but had the butter-like texture inside. Ox cheeks and chipotle are new best friends. Trim the ox cheeks of excess fat and discard any connective tissue. Cut the cheeks into manageable chunks. Heat the oil in a deep, heavy based saucepan. Meanwhile coat the cheeks in the flour mixed with salt and pepper. Seal the cheeks for a couple of minutes or until nicely coloured. Do this in two or three batches and season with salt. If all the meat is put in at once the pan cools and the meat starts to stew and turn grey. Sealing the meat in smaller batches brings out a nicer colour and ensures flavour maximisation. Remove the cheeks from the pan set aside once coloured. Add chopped onion to the pan and fry for a minute or two until soft. Put all the cheeks back into the pan with the onion. At this point add the seasoning: the cumin, oregano, epazote, cayenne. Add the garlic, kept whole. Roughly cut up the chipotle in adobo and add this to the mix with some of the sauce of the adobo. Add the additional chipotle (if this is dried chipotle this should have been rehydrated prior) and a squeeze of tomato puree. Add the red wine and red wine vinegar. Give it a few moments for some of the alcohol to burn off, then add the beef stock. Ensure that there is enough liquid to just cover the meat. Slow cook on the lowest available heat on the hob for 3 hours or so, until the meat is fork tender. Keep a periodic eye on the meat to ensure it’s not sticking to the bottom of the pan. If the mix is becoming too dry, add more water. 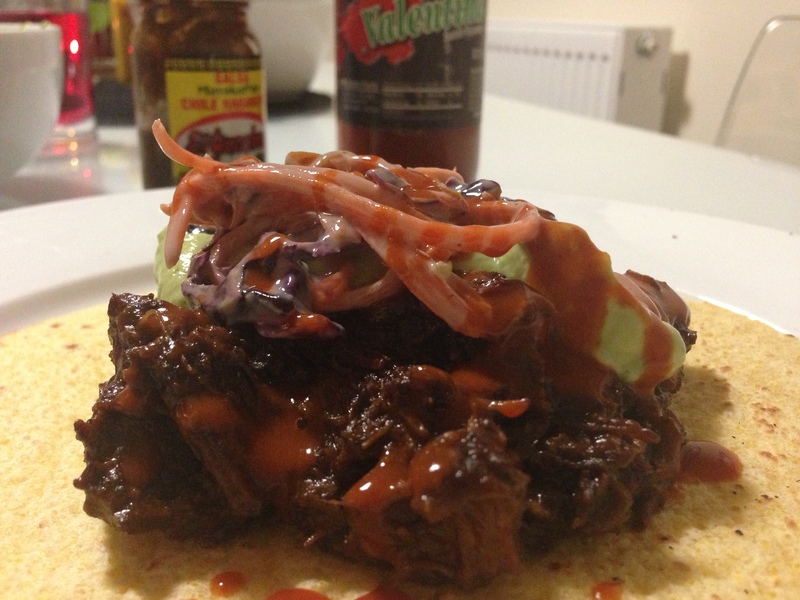 Serve the Ox Cheeks in tacos, beans, guacamole and slaw. This entry was posted in Beef, Burritos, Ox Cheek, Tacos and tagged Atomi, beef, Braised, Bristol, Burritos, Chipotle, Death By Burrito, Hot Sauce, Mexican, Ox Cheek, Shoreditch, Slow Cooking. Bookmark the permalink.